My friend Cayla : Or is she ? Remember chucky from Child’s Play movie . I have seen this movie in my childhood and liked it but I am not really a fan of child’s play series but its an okay time pass. it was a great idea though , to introduce an evil doll which goes around doing its best , doing evil things and scaring people on screen and those who watching it . when I was little it did get into me and scared me a bit but those were childhood days . not any more . But recently I came across the news which was doing rounds . about the doll name Cayla . In Germany this doll is banned due to number of reasons. 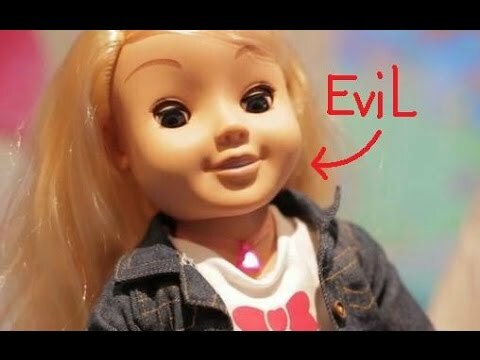 yes, certainly not that doll is possessed by n evil spirt but experts says it posed threat bigger than an evil . This doll comes with blue tooth devices pre installed for communication and can access internet and google to answer questions or lets say in simple terms can interact with its user in number of ways, yes of course everything these days comes with internet enabled devices to make our lives easy and more interactive but of course it also paves the way for hackers to hack the device . Vulnerable children playing with Cayla unaware of the hack can leak significant information which is private and a person on far end can make use of this information in number of ways . needless to say what one can do once h/she has an access to confidential information . So our friend Cayla is really our friend ? it’s a matter of debate . obviously the company says it’s indeed a friend and there is no need to worry about . but experts says its a threat and I echo the same . privacy is the biggest luxury one can buy these days . and our lives are not private any more . we are trapped in a world where we have to keep up the pace with the rest , if we don’t then the fear of staying behind in the rat race sinks in. technology has made our lives easy but we have paid a huge cost of this luxury . Let not our children childhood get destroy by these innovations. innovation is good but our children are not strong to fight this threat . they are innocent and vulnerable . We have lived our lives without all this before also . and we can live again.